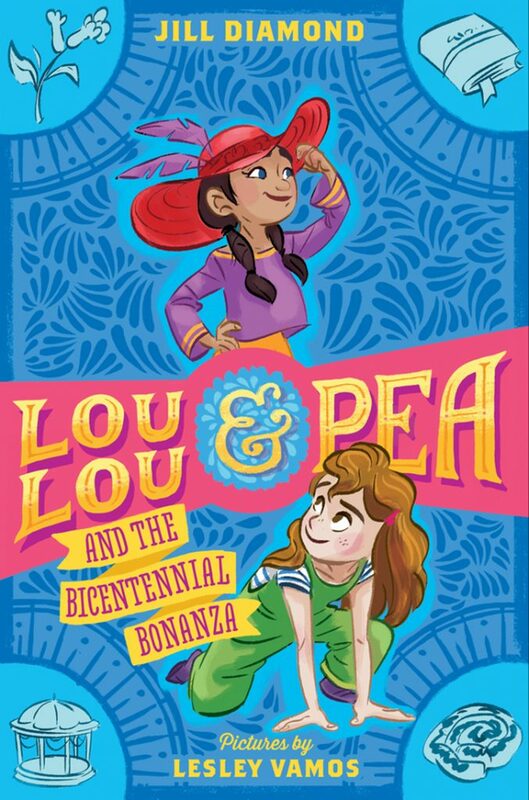 Lou Lou and Pea are back for another mysterious adventure in their newest book, Lou Lou and Pea and the Bicentennial Bonanza! These two besties are getting ready for their city’s big two-hundredth birthday celebration – the Bicentennial Bonanza! The event is set to take place in El Corazón, Lou Lou and Pea’s neighborhood that feels more like family and is vibrant with culture. The big day is set to include everything from a bake-off to a talent show, they’re even going to be building a new gazebo in town. The community couldn’t be more excited for the festivities and to honor their city in this special way. That is until Vice-Mayor Andy Argyle shows up to shake things up! He believes that the celebrations should be held in Verde Valley and uses some shady evidence as proof. Thankfully, Lou Lou and Pea are on the case and ready to get to the bottom of this suspicious situation! Even if you haven’t read Mural Mystery, the first Lou Lou and Pea novel, you’ll still be able to pick up Bicentennial Bonanza with no problems. (Though we highly recommend reading both as they’re such fun, imaginative reads!) We love the way the author weaves in bits of Spanish language and a whole lot of diversity throughout the story, it truly makes the neighborhood feel alive. 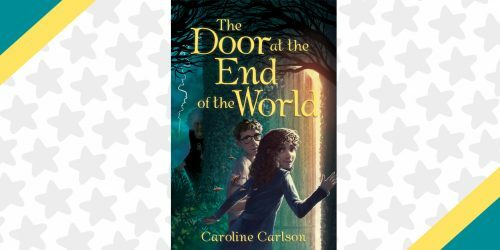 Lou Lou and Pea are amazing friends, and their world feels so real, as if you could easily put down the book and walk over to El Corazón to spend time with them. They have a really positive female friendship and are the spunky, unique friends you hope to meet at school or in your own neighborhood. Plus, the mysteries in the Lou Lou and Pea books are just so much fun to try and unravel while reading right alongside them. There is even a DIY for a garden party hat at the back of the book, so you can join in on the Bicentennial Bonanza at home. 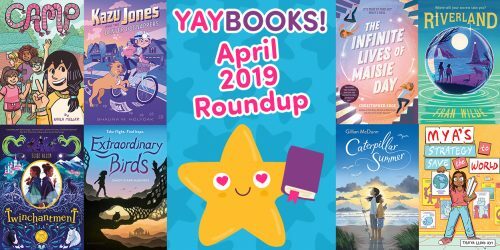 Author Jill Diamond was kind enough to share some fun facts to help you get to know the characters, the story, and how real places in San Fransisco inspired the setting for the book! Lou Lou’s real name is Louise, which is also my middle name. Unlike Lou Lou, I really like the name Louise and would happily let people call me that. Lou Lou’s name was originally Lucille (after my grandmother) but an early reader pointed out that her nickname would then be Lulu. Since I wanted to keep the “o”s in her name, I changed it to Louise. Caracoles, the pastry from Lou Lou and Pea and the Bicentennial Bonanza, are inspired by conchas (Mexican sweet bread), though the two are quite different. Caracol means snail in Spanish. I have always wanted to dress in one print head-to-toe like the Argyles in Bonanza, but I’ve never been ambitious enough to pull that off. The closest I have come is wearing a lot of polka dots. Since my last name is Diamond, I should probably also choose argyle as my “signature” print, something I hadn’t considered until right now! The Heliotrope is named after my favorite perfume from Hove Parfumeur, a small shop in New Orleans that’s been in business since 1931. 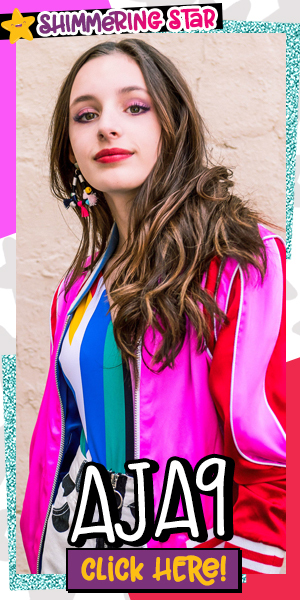 In fact, much about the Heliotrope is inspired by New Orleans – the fancy, plush interior and Ella Divine’s music – and it is the one place in the book inspired by a city other than San Francisco. I love New Orleans, and I wrote part of Lou Lou and Pea and the Mural Mystery there. 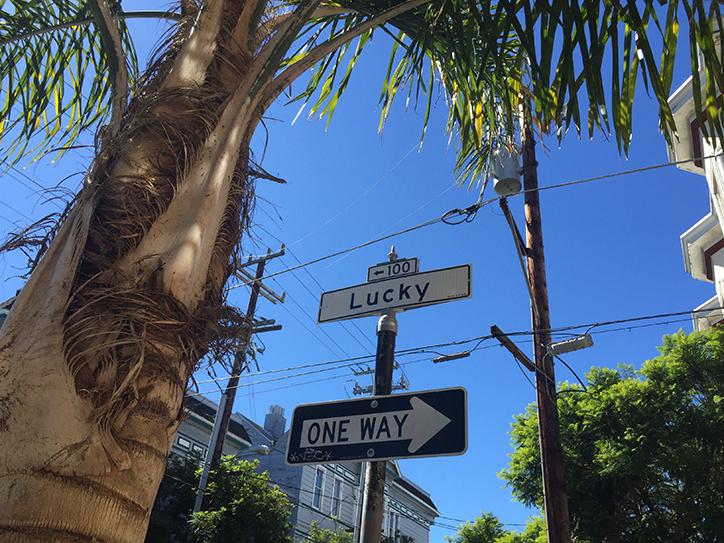 Lucky Alley is a real street in the Mission District in San Francisco (technically called Lucky Street, but everyone I know calls it Lucky Alley). Unfortunately, there is no nautical house on the real Lucky Alley, but I think there definitely should be. Kyle Longfellow and Pea might get married when they’re grown up. Or not. But just sayin’, you never know. Both Lou Lou and Pea are only children because I am an only child, and I have absolutely no idea what it’s like to have a sibling. I imagine it involves a lot of sharing which I am not always great at, especially if it involves dessert. 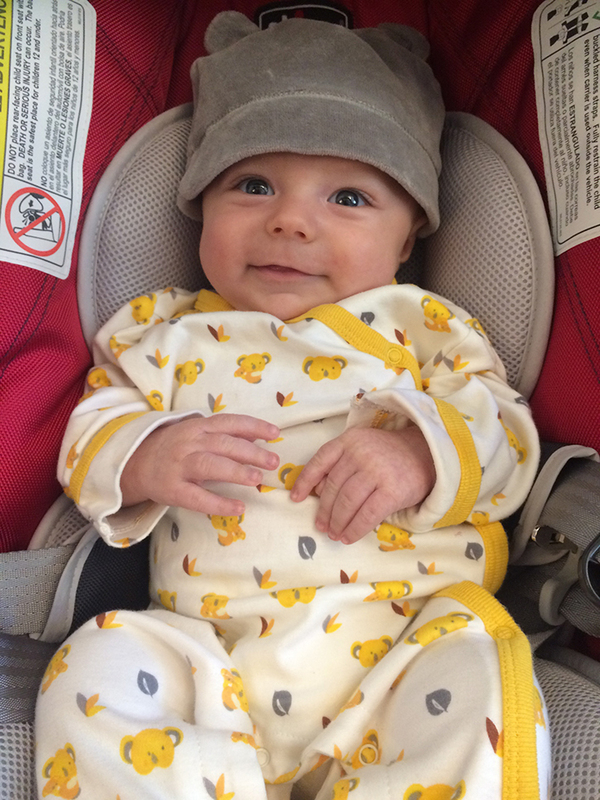 I wrote Bonanza when I had a newborn, so some of the wackiness comes from me not getting enough sleep. It’s a lot easier to find quotes about fashion than about horticulture, one of the reasons that Lou Lou makes up her quotes in the book. We have landscaping goats in San Francisco just like Kyle’s goats in Bonanza. The city uses them to clear land, and people can rent them from an organization that also offers a yoga class with baby goats. I don’t have any land to landscape, and I don’t do yoga, but I’ve always wanted to rent a goat for a day just to hang out with me. Um, #goatgoals! Can we also hire a goat to be our bestie? Silliness aside, we hope you loved Jill’s inside peek into Lou Lou and Pea’s latest adventures! 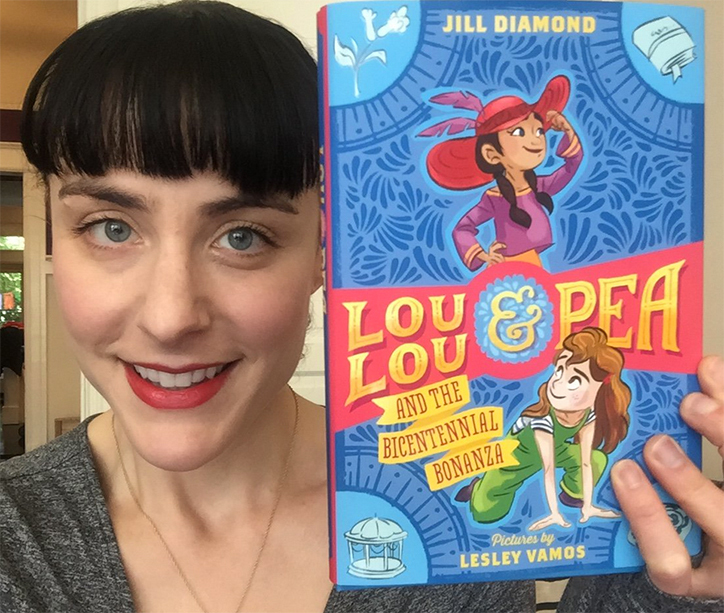 If you’re in the Bay Area, please join Jill for the launch party for Lou Lou and Pea and the Bicentennial Bonanza on Thursday, April 26th at 5:30 p.m. at Folio Books (3957 24th Street, San Francisco). There will be a neighborhood treasure hunt from 5:30-6:15, prizes, food and drinks, and a reading! Ready to get reading? 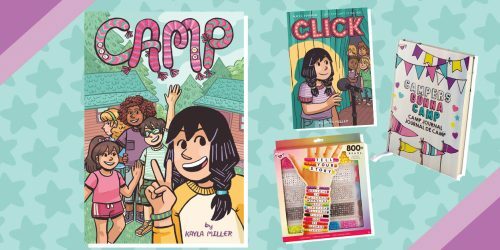 The book is now available from Farrar, Straus and Giroux Books for Young Readers. Looking for more stories with fabulous female friendships? We think you’ll love The Art of the Swap by Kris Asselin and Jen Malone!